As students are getting ready to make a leap from high school to university, it’s important for them to learn how to budget their money while away from home. Being a student at a post-secondary institution is a full-time job and has not been made any easier by rising costs (on everything) including schooling. All in costs for post-secondary education in Canada can now easily top $20,000 a year according to an article by the National Post. How are you planning for your post-secondary education this year? Waiting for a lottery win won’t cut it. Take a look at financial programs to investigate what kind of government assistance you can acquire. This does not have to be done before entering school. Some grants and bursaries are offered throughout the year. A good website to review is yconic.com which shows student awards, bursaries and scholarships that you can use for the purpose of your schooling. In an economy, where it is difficult for students to get stable part-time work, it can be beneficial to enter an essay writing contest like the one being offered at our CEW website. You can also check out lowestrates.ca for their students guide to make balancing your financial books easier. Depending on which college or university you are attending, you need to plan what you need to purchase before the year begins. 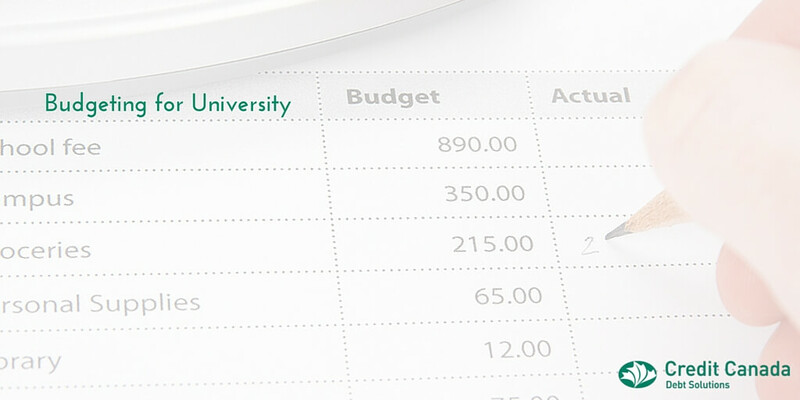 Try creating a budget that you can reference throughout the year while monitoring your spending. Take all the funds you have into account: RESP? OSAP? Summer job savings? Money from the bank of Mom and Dad? Make sure to add it all up and plan out for the short-term and long-term of your school year. Your money has to be built to last as expenses add up quickly. If you need help with your calculations, please see your institution’s website or try Credit Canada's budget calculator. If you are having a problem making a budget or you feel it’s a four letter word, contact us here. We can help get you on the right track with your finances. It’s a must to keep reviewing these expenses monthly to determine if they are realistic and fit in with your other costs. The first day of school usually comes with a whole banquet of credit cards being offered. Businesses are practically giving them away the first day of school but that does not mean you should bite. Do your research and see if you are getting the best deal for the credit card. Ideally, you should not be applying for a credit card if you do not have a job. The more important question is, ‘Do you really need the card?’ To see how much your credit purchases could cost you if you only make the minimum payment, visit creditcanada.com and give our calculator a go to see how your purchases could ultimately be. If you are leaving home for the first time, it is good to do some research on an insurance company that carries tenant insurance. Not all damages in your unit are covered by your landlord and it’s best not be shocked when something does happen and you are left with a mess. Doing a little homework and searching for the right coverage and premium can definitely pay off in the end. Food is an expensive proposition due to costs going up on everything as I stated earlier. Consider buying foods that will last and that can be used or prepared for different meals so nothing goes to waste. Planning your meals and having a list when you go shopping will go a long way to saving you money. See about getting computer or phone applications like flipp.com to compare various flyers and see where you can get the best deals. Do some investigating on the best savings and chequing accounts available. Try to get the best student rate you can get. Don’t be afraid to ask. You may need to move money from your savings account to your chequing account from time to time to make sure your weekly or monthly costs are covered. Look for activities on the cheap which you can find through your school or check out what kinds of activities are going on in and around your campus or city. Following tips like these can go a long way to saving you money during the school year. Feel free to take a look at our blogs at creditcanada.com or Focus Magazine for additional saving tips.